Carlos Núñez shares with us his vision of Celtic culture as a millenary utopia that, for centuries, has created a universal imagery that today continues to be an inexhaustible source of artistic inspiration. The book analyses Celtic music from multiple perspectives: historical, musicological, cultural, etc., and deals with very diverse aspects: its relationship with other music and styles, its forms, the characteristic instruments used for its performance, its territorial scope of expansion and influence, etc. At the same time, he narrates numerous personal experiences related to his activity as a performer of this material and his contacts with a large number of experts in the field from different disciplines: musicians, historians, anthropologists, chroniclers, etc. 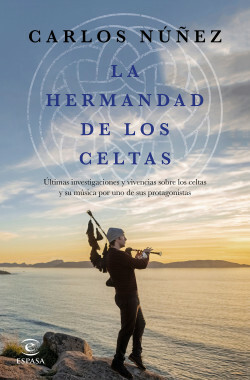 Latest research and experiences about the Celts and their music by one of their protagonists. For more than 20 years, Carlos Núñez has triumphed the world over with his bagpipe.